On May 29, USPTO also paid a remarkable visit to China’s State Intellectual Property Office, to review a range of issues in our bilateral cooperation agenda. The Commissioner of SIPO hosted our visit, which included me and my co-author of this blog post—Director of the USPTO David Kappos—as well as Solicitor Ray Chen, Attorney-Advisor Joel Blank, and one of the local lawyers in our Attache’s office, Li Jing. Commissioner Tian is currently the longest serving commissioner of the five largest patent offices, and is likely the only major patent office director who has been there since his office was first established. According to Prof. Guo Shoukang of Renmin University (another remarkable contributor to China’s IP system), Tian Lipu was in the first class of his students who were educated to help establish an IP system in China over 30 years ago. One of the issues we discussed with Commissioner Tian was how to handle design protection for graphical user interfaces (GUI). Design protection of GUIs is important in addressing the increasing phenomenon of migration of real objects to virtual objects, such as cell phones or laptops, or the GUI of a refrigerator to enable its remote control. There is also a need to provide more robust protection for designs in the borderless computing “cloud.” Although SIPO’s patent examination guidelines currently deny design protection to GUIs, Commissioner Tian recognized that as a technology-based organization, SIPO needs to address emerging new technologies and adjust its examination and patentability policies accordingly. He also welcomed discussion on other issues, such as test data requirements for pharmaceutical patents. On issues involving patent law harmonization, patent prosecution highways, improving PCT procedures to insure greater efficiency and reduce costs, and patent classification, Commissioner Tian showed an openness and willingness to engage on shared challenges facing major patent offices, including consideration of solutions USPTO has been proposing. Commissioner Tian’s leadership was also evident in discussing issues such as software asset management. We discussed the possibility of working together to insure both our offices, as leaders in IP protection, have strong software asset management practices. The Commissioner took up the opportunity, and we look forward to working on this together in the near future. Perhaps the most remarkable proposals reflected SIPO’s efforts to expand its role on the international stage. First, Commissioner Tian offered to provide training to U.S. examiners on Chinese patent examination techniques. Currently SIPO runs two sessions of these training programs, one in English and one in Chinese, which he invited USPTO to participate in. Second, he noted that SIPO was planning to propose an effort at the forthcoming IP5 meeting to provide cloud-based sharing of patent and patent application information, an idea similar to USPTO efforts in this area. SIPO was also supportive of our efforts to improve the efficiency and operation of the PCT system, including measures that can reduce costs and improve PCT availability for smaller enterprises. Commissioner Tian also took the time to note the contribution of the United States in inviting China to join the IP5, as well as the contribution of the United States to initial establishment of the Chinese patent office. For many years, China had been reluctant to recognize the hard work we have done. Some scholars, such as Bill Hennessey at Franklin Pierce Law School, have also recently called attention to the early contributions of the United States to China’s IP regime, as well as the importance of IP to China’s overall economic reforms. The recognition we received from SIPO was most welcome. Since the 1980’s, China’s patent office has grown to be one of the largest offices in the world—now about the same size as USPTO. In this respect, the decision made six years ago by the USPTO to invite China to expand the IP trilateral (USPTO, JPO and EPO) to include the Korean Patent Office and SIPO was not only historic, but in retrospect mandatory. I was the person who first placed the phone call to SIPO to initiate that process on Dec. 24, 2006, which resulted in a formal invitation in 2007. SIPO’s early development relied heavily on European, particularly German support, and SIPO’s growth reflects well on the contributions made by European colleagues. Nonetheless, many of us involved in China IP matters have wondered whether SIPO, as a rising IP force, will be a responsible stakeholder in global intellectual property, and play a constructive role as other major offices have. Former U.S. Trade Representative Robert Zoellick first raised the issue in 2005 in terms of China’s overall engagement on trade and foreign policy issues, and has continued to raise the issue since. In the area of intellectual property the issues are further burdened by contentious bilateral and multilateral disputes with China, concerns over China’s innovation policies, and China’s willingness to respond to emerging challenges of new technologies as well as the pressures placed on patent offices globally and support efforts such as PCT reform and patent law harmonization. The answers that the USPTO heard at our meeting with SIPO were encouraging. The critical importance of cooperation was underscored by Commissioner Tian himself a day earlier at the Renmin University Judicial Conference, when he noted that the USPTO and SIPO now account for approximately 50 percent of all patent applications in the world. From USPTO’s perspective, as we together carry such a large share of global patent applications, we need to both be fully committed to the global IP system. We may not always agree on policies and strategies, but having another partner emerge who is committed to the development of the global IP system is a welcome development. CCTV videos in Chinese and English. This entry was posted in China IPR, Chinese Intellectual Property practice, Chinese IP Law, Regional Developments, USPTO and tagged China Law Society, Global IP System, GUI, Intellectual Property Adjudication Program, IP5 meeting IP Trilateral, Renmin University Judicial Conference, Renmin University of China, SIPO, Tian Lipu, U.S. Court of Appeals for the Federal Circuit, USPTO. 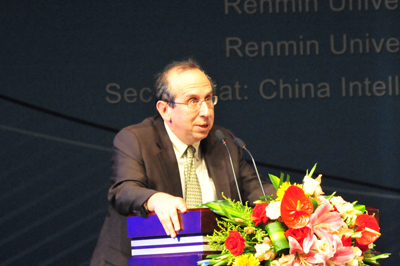 The China Renmin University news and IPR in China also covered the presentations in the opening ceremony.